It’s hot here in Chicago and I should probably be making icebox pies, but instead I’m obsessed with red velvet again and wondering if my favorite recipe is still worthy. Of course to determine that I had to make my favorite red velvet cake again. Here’s a photo. Yes! The red velvet flavor is just right — a conglomeration of flavors that’s hard to describe, but in my mind it tastes kind of tangy, buttery and vanilla-ish with a hint of cocoa at the end. Or better yet, it’s just red velvet. The texture is tight crumbed and moist rather than loose crumbed and oily like some of my older recipes for red velvet cake. For instance, the one I linked to uses quite a bit of oil and is made with self-rising flour. Anyhow, this recipe calls for a mixture of cake flour. The cake flour keeps it tender and the all-purpose adds structure. Theoretically you could probably weigh out the same gram amount of pastry flour and use that, but I went with a mixture of King Arthur’s unbleached cake flour and KA’s all-purpose flour. For the red food coloring I used 2 tablespoons of McCormick, and for the chocolate flavoring I kept to tradition and used only 2 tablespoons of cocoa so that the chocolate wouldn’t overpower the red velvet flavor which is unique unto itself. And then there’s the issue of the butter. I used mostly butter, but swapped out bit of it for oil to add a little more moisture. I need to put this cake up against one made with a cup of oil and no butter and see what the masses prefer. For now, here’s the latest incarnation of my favorite recipe. I want to put it up against this one, which comes up first in the search for good red velvet cakes. Oh, and one final note. I usually make it in two 9 inch round cake pans so it’s not a very tall cake, but if you like your cakes taller, you can make it in an 8 inch cake pan and it will look like the one in the photo above. 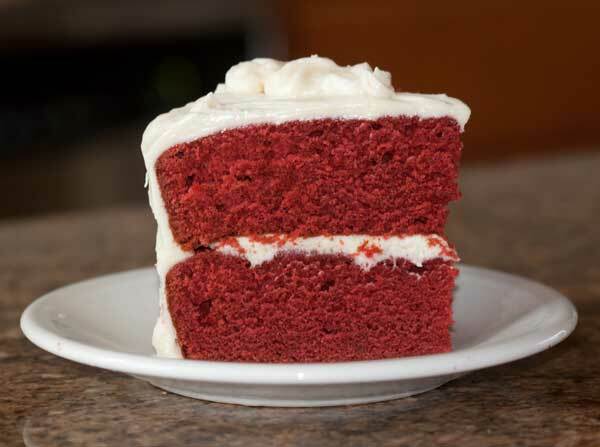 Red Velvet Cake made with a mixture of all-purpose and cake flour. I use a hand held electric mixer and a heavy duty scraper for stirring, but feel free to use a stand mixer if you prefer. Preheat the oven to 350°F. Grease and flour two 9 inch round cake pans. For a taller cake you may use 8 inch round pans, but the bake time will need to be increased slightly because the cake will be deeper. Thoroughly mix the flours, baking soda and salt together and set aside. In a large mixing bowl, using a hand held electric mixer, beat the butter until creamy; add oil and sugar and beat for another minute, scraping sides of the bowl. Add the eggs one at a time, beating on low speed for 30 seconds after each egg is added, then increase speed and beat on high for another minute. Beat in the vanilla. Stir in the cocoa powder and red food coloring, then beat with the mixer until blended and smooth. Beat in the vinegar. Using a heavy duty scraper, stir the flour and the buttermilk into the red mixture, alternating between the two (flour, milk, flour, milk, flour). Beat about 30 strokes with the scraper or until there are no lumps of flour and mixture is smooth and red. If batter is lumpy, beat with the electric mixer for no longer than 30 seconds -- don't overdo it or you'll build up the gluten too much. Spread evenly in pans and bake for 25 minutes (30 minutes for the 8 inch pans) or until a toothpick inserted in center comes out clean. Cool in pans on wire rack 10 minutes. Invert onto a cooling rack and let cool completely. Frost and stack the cakes. The cake turned out great! Just like you described. Tight crumbed and moist. Perfect balance of frosting and cake. Definitely a go to recipe! Thank you!! Yes, just regular liquid food coloring — the kind you find in the spice aisle (like McCormick). 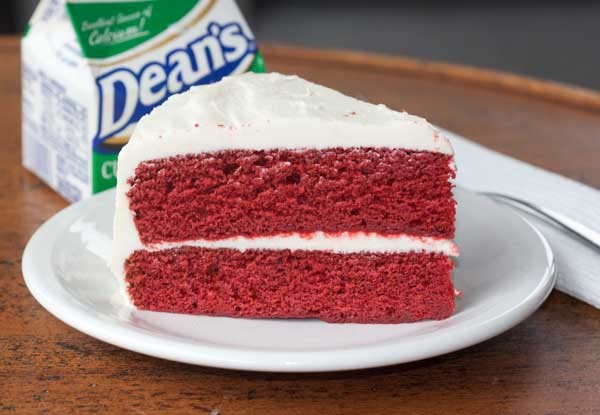 My favorite is actually Super Red, but you have to order that or buy it from cake decorating stores. I’m going to make this tonight after work. I think I have gel food color. It looks like you used liquid food color. Is that correct? Sue, I’d have to look through my cupcakes and check. I think I have made it as cupcakes. Yesterday I was at a restaurant that had a dessert made with two layers of red velvet cake and a layer of cheesecake between. Each serving was individually iced and decorated. It was beautiful. Someone at a nearby table ordered it so I got to see it sliced when the two ladies cut it in half to share it. 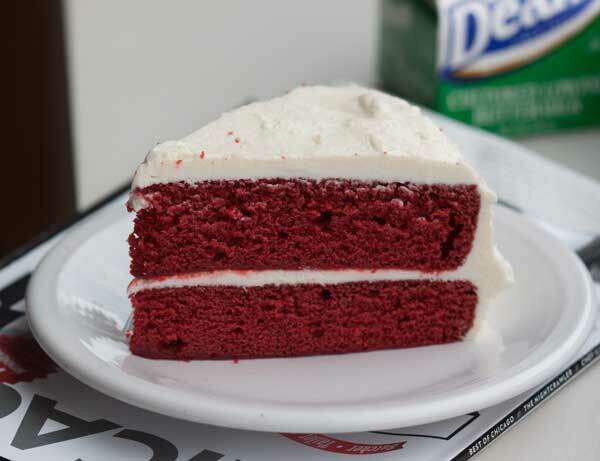 I hadn’t thought about red velvet cake in a long time until then and now I see this here! Have you ever made cupcakes with this recipe? In the past I just went with 95 grams or whatever and didn’t have a problem. The eggs I’m buying in Chicago are a little larger. So if your large eggs come up shy of a 100 grams do you add more white, or just beat one egg and add until 100 grams?